Philip Hammond will deliver his Spring Budget on 8 March. This will be the first and last ever Spring Budget, as the main tax announcements will be switched to the autumn in future. But what can we expect when the Chancellor delivers his speech next week? 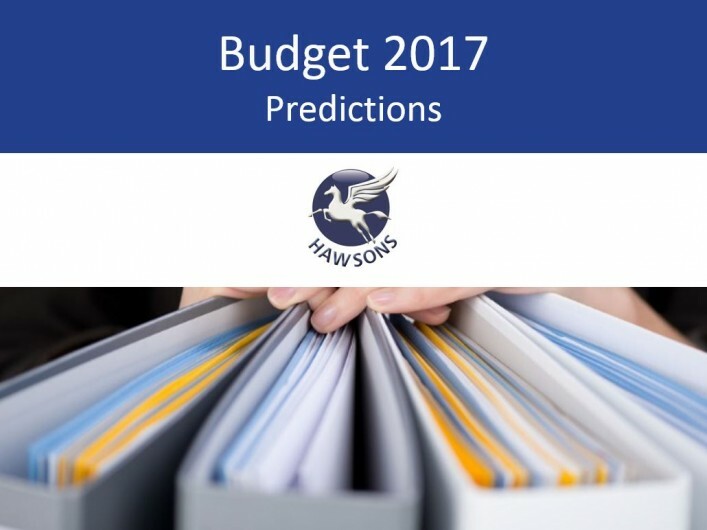 Craig Walker, tax specialist at Hawsons, gazes into his crystal ball. The Chancellor has previously spoken of the need for the UK economy to be “match fit” after the Brexit negotiations. He has promised to do this by raising the overall productivity of the economy to the level of the best by investing in the infrastructure, the R&D, the skills and the innovation. The Chancellor is expected to announce targeted funding for these areas in his Spring Budget. With borrowing costs and gilt yields low, the Chancellor has an excellent opportunity to finance extra investment in UK infrastructure. Also expect announcements in transport, energy and broadband given their role in boosting national productivity. The Chancellor will wish to support R&D and technology, perhaps by increasing grant funding and tax incentives for innovative businesses. Stronger than expected monthly tax receipts gives the Chancellor a little more room for manoeuvre in his Spring Budget. The public finances were recently bolstered by an increase in Self-Assessment tax receipts and a bumper flow of capital gains tax, along with a 5% rise in corporation tax receipts and a 3.7% increase in VAT receipts on the same month last year. Could this put the Chancellor in a position to deliver tax cuts? It seems unlikely that the Chancellor will offer any major giveaways ahead of the start of the Brexit negotiations. In these uncertain times, the Chancellor is likely to hold some ammunition back, in case the economy proves weaker in the run-up to the UK’s departure from the EU. Therefore, we may have to wait until the Autumn Budget in November for any significant policy announcements to be made. Nonetheless, the Chancellor will be looking for ways to support UK businesses and send positive signals to the international business community. The Chancellor is also under pressure to provide more support to public services that are under strain, such as the NHS, social care and education. Businesses want some clear signs of support from Mr Hammond and it is hoped that his announcement will reassure businesses and support investment. The Chancellor is under pressure to ease the introduction of business rate rises that come into force from April, which will see many businesses face a 500% hike. It is unlikely that the Chancellor will announce any significant changes to this given that the bills are already being prepared by local authorities, however he could help those businesses facing the steepest increases by making the transitional relief scheme more beneficial. The Chancellor could also consider raising the £12,000 RV threshold for 100% relief from business rates to help small businesses. It is expected that we will see limited personal tax changes in the Spring Budget. We are in the process of very substantial changes to the UK tax system, most notably through the Making Tax Digital project, and now does not appear to be the time for further significant change. The personal allowance is set to rise from £11,000 to £11,500 in April 2017. The Government has promised to cut the rate of corporation tax to 17% by 2020. Mr Hammond may be tempted to reduce the rate further, perhaps to as low as 15%, to send a strong signal that the UK remains a good place to do business following Brexit. Alternatively, he may look to bring forward the date of the planned reduction to 17%. Last year it was announced that National Insurance Contributions (NIC) for employees and employers would be aligned at £157 per week from April. This represents a significant cost increase for some employers and the raise has proven to be unpopular. A decision to scrap the proposed increase would be well received, particularly by the largest employers who will pay the most, but a u-turn is thought to be unlikely. The controversial Apprenticeship Levy is also due for introduction shortly and is likely to go ahead. Any steps to reduce administration or introduce simplifications would be warmly received by employers. Changes to employment tax will see public sector bodies take on more responsibility for assessing whether services are provided by quasi-employees through their personal service companies. In addition, many salary sacrifice arrangements will cease to offer tax/NIC savings, as announced in the Autumn Statement. There is concern that the Chancellor may signal a move to ask private sector engagers to follow the public sector in assessing whether or not PAYE should be operated on personal service companies. This would require a period of consultation prior to implementation as it would represent a highly complex change. This relates to HMRC’s controversial project to move to a fully digital tax system by 2020. You can read our latest article on the proposals here. The project is scheduled to apply from April 2018 for businesses and landlords with turnover over £10,000 per year. Such fundamental change to the tax system requires thorough consideration and testing and it is hoped that the start date will be deferred to allow for this. It is also hoped that the turnover threshold will be increased significantly from £10,000 to the VAT registration limit of £83,000. This article comes with the usual disclaimer regarding all rumours and predictions: they should not be considered fact until they have been uttered by Mr Hammond himself. Our tax specialists will be watching the Budget on Wednesday (8th March) and providing live commentary as it unfolds. To pick up on our commentary, follow us on Twitter (@Hawsons) or LinkedIn.